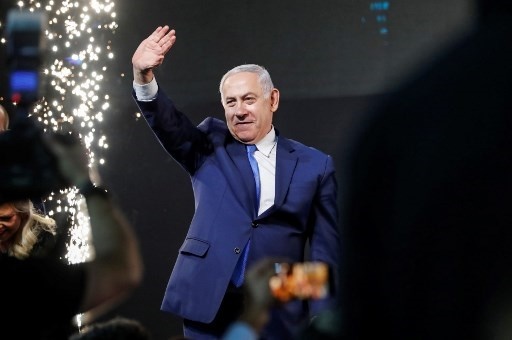 Israel's Prime Minister Benjamin Netanyahu was on path for victory in Israel's election on Wednesday after nearly complete results put him in position to form a right-wing coalition and further extend his long tenure in office. But with 97% of the votes counted, results showed the Likud and other right-wing parties allied to him with some 65 seats in the 120-seat parliament. Earlier while addressing cheering supporters who waived Israeli flags at an event hall in Tel Aviv, Gantz called it a "historic day". Speaking to journalists outside his home on Wednesday morning, Gantz said "we're waiting until the end of the results". "This is a historic accomplishment. There has never been a party so large, so significant, with so many good people that was founded in such a short period of time." Turnout was 67.9% compared to 71.8% in the last election in 2015.